Picture this; you live in the countryside, and it is pitch dark as it is wont to be on most nights. You hear a ruffling in the woods, but it is too dark to see anything. The headlight at your backyard can only reach so far before the light dims. How do you tell whether those are raccoons trying your patience or it is a large animal seeking to establish its territory right in your backyard? Now the dogs are barking furiously, and you wish you had the brightest headlamp you could get at the shops, just to establish the cause of the ruckus. Unfortunately, you don’t, but then your dogs are courageous enough to venture out with you. In as much as the animal may eventually find a way to avoid bargaining with ferocious canines, you will need to look into that flashlight if you hope to have a pair of extra eyes at night. How Do You Use A Headlamp? Which One Do We Like Best? Headlamps differ from flashlights in one major way; they are worn on the head so that you can have the use of both hands. They are ideal in all situations that need light and mainly outdoor fun activities. A few scenarios will require you to have a headlamp, but mostly if you are the outdoor kind. Trekking in the woods? You will certainly need some light if you hope to keep going after the sun has set. A headlamp is great because it is hands-free, it's like having a flashlight for your head. Biking in the wild? Better bring a headlamp along for when the sun goes to sleep. These headlamps are also great for hunting and fishing out early in the mornings or late at night. Backpackers are another lot that finds a lot of use for this gear (I should know this; I am one). Most of the times, you do not know what to expect in the place that you are bravely going, except what you read online. Having the best led headlamp saves you madness you were not ready for (like power just going off the moment you check into a remote hotel). If you are the kind that loves to run in the dark, a bright shining headlamp lights the way without needing you to hold it. They types that we are about to review below are excellent at saving the battery while lighting your way as optimally as you would prefer. Imagine a headlamp that doesn’t need your manual operation to increase or decrease light? Yes, that is what we are about to look at. The first thing we noticed about this headlamp was the weight. It is feather-light at 113g. It has a flexible band so that children and adults alike can wear it and be comfortable. The two adjustable buckles have a maximum circumference of 21.6in/55cm and a minimum of 13.7in/35cm. You can stretch it further if you wish for it to cover a larger circumference. The band is comfortable and elastic so that you can wear it over hats and caps. It looks good, which is a bonus seeing that aesthetics would not be a deal breaker. It is weatherproof, with an IP44 rating. With this rating, it can withstand splashing from all angles. It is not ideal for submersion, but then again that is not very important when you are only doing a hike or trek. The beam from this headlamp will shine as far as 20 feet on its brightest setting. The beam will be broad enough to cover your running and working space. It contains a red LED light for night running and visibility when on the road with other users. The two red LEDs flash all through as long as you are using the headlamp. However, you can intentionally turn them off, especially if you are only reading and not running out in the dark. The 18 white LED lights make this headlamp the ideal camp gear. It illuminates far and wide, its splash of white being visible from a distance. One of the most impressive things about the lighting is that you can adjust it to your liking. You can reduce the beam and spotlight from the settings to fit what you are doing. Thanks to this ability, you can use it for reading on your Kindle as well as outdoors for running and adventures. Walking or running in darkness. Riding a bike in the dark. Reading a book or cooking in the dark. The band is flexible and padded for comfort. The light settings give you the power to decide how much brilliance you want. ​20 feet is only so far. This headlamp is a looker with a band that looks as sturdy as it is. 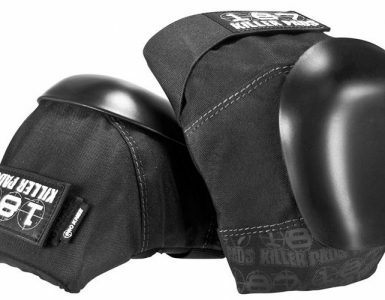 It is black and black, with a padded interior that makes it comfortable for extended wear. You can wear it on your head, waist, or even place it on the table. It weighs 4.8 ounces, which makes it ideal for running, biking, and other activities that do not need an extra load. This headlamp uses rechargeable batteries, 3.7V 18650, which will run according to your utilization. There is nothing on the lighting to warn you that the battery is low, and so you may want to ensure that you charge it whenever the light dims. The batteries need up to 6 hours to charge, during which time it would be safe to leave the headlamp undisturbed. The package comes with two batteries, so all you will need to do is charge it and be set. It has an IPX 4 rating that prevents it from crashing when splashed from all angles. This headlamp will survive torrential rains when you get unlucky with nature. One is the red LED that blinks to keep you visible from a distance. The second is the white LED that keeps it brighter than all other flashlights in its price category. 1,800 lumens is the distance that you cover with this headlamp. Only a handful on the market can measure up to this distance. This headlamp not only does well out there on the campsite and trails, but it also works well indoors. You can adjust the light to read, cook work under the sink or on your car, and pretty much any space that needs lighting. Three modes for light settings. ​The battery is rechargeable, and so you have to carry a solar charger when taking it away for days. ​You cannot have it on pulsating mode and high at the same time. This headlamp catches your attention immediately for one thing; being one of the lightest at only 2.6oz. That is super impressive for a lamp with its capability. Over a thousand reviewers share these sentiments. The band is adjustable to fit on adults and children alike. 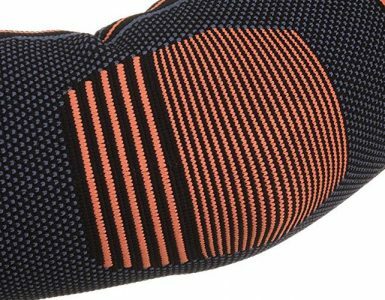 It has padding for comfortable wearing, and it also lasts long, thanks to its elastic make. It does not share the bright colors of most headlamps, but that is not an important aspect, now, is it? What is has that makes up for anything it could lack is weatherproof abilities and shock resistance. Yes, a fall will not harm this baby; neither will heavy rains hitting it from all directions. Since we buy these flashlights for the light, let us look into it. This headlight has five modes: High beam, Low beam, White Strobe, Red Beam, and Red Flashing. The flashing light keeps you visible during rides or other nightly adventures, but it does not stay on its own. You would have one of the other beams on too for enough light. It has two separate switches for each of the colors; the white LED as well as the red LED. How far can it shine? Up to 160 lumens. This is enough light for night walking, riding or running. It will also come in handy when working in the garage. It comes with 3 AAA Duracell batteries, saving you the initial cost. The batteries are rechargeable and will last for more than 12 hours with continuous use. Intermittent use will stretch its battery life. The batteries will need about 6 hours of charging. Perfect for reading in the dark, riding the bike at night, working on your car, and lighting up the tent. Can be adjusted to 45 degrees. ​It has no reflector on the back for rear visibility. InnoGear is known for innovative items, and this headlamp is no different. The package comes with two 3.7v, 4400mAh batteries, and so you are saved the initial cost. These batteries will last you a hood while depending on usage. Rechargeable batteries are both convenient and inconvenient for two reasons. Convenient because it saves you the constant costs, but inconvenient for the fact that you would have to carry a solar charger or power bank to keep it functional when leaving home for long. It also comes with both a cable charger and a wall charger to keep it fully functional at all times. When fully charged, you can count on it to work continuously for a maximum 4 hours. Oh, and should your phone ran out of charge, the USB port on the light will help you charge it. InnoGear headlight has four working modes; high, low, mid, and flashing. Here is where you adjust your lighting to suit your needs. How can you use this headlight? In several ways including outdoor runs and walks, reading, working under the sink and in the garage, camping, and fishing. For this headlight, InnoGear includes a wall charger for those outdoor expeditions such as fishing. It has an output of up to 5000 lumen, which is quite bright for the outdoors as well as indoor activities. The two rechargeable batteries save you cost and serve you for a long time before requiring replacement. The company says that this headli9ght has a lifespan of 100,000 hours. If you let the lamp light on continuously, the batteries will last a maximum 4 hours before dimming. They will need 6 hours to charge fully. Intermittent lighting will certainly keep then burning for longer. It has four working modes: high, middle, low, and flashing. 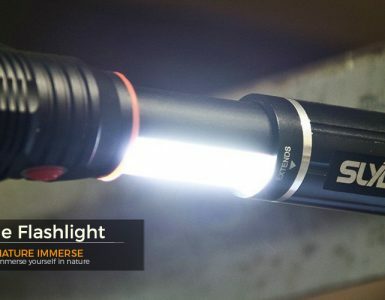 With a brilliance of 5,000 lumens, you can use this flashlight for fishing, riding the bike, running and walking in the dark, and working at home. The settings will allow you to adjust both the beam and spotlight to suit your needs at that time. Is it flexible? Yes, at 90 degrees up and down. When you choose your angle, it stays put even with constant movement. The band is especially sturdy to hold ideally to the head. We like the padding that helps it sit comfortably on the head without hurting you. 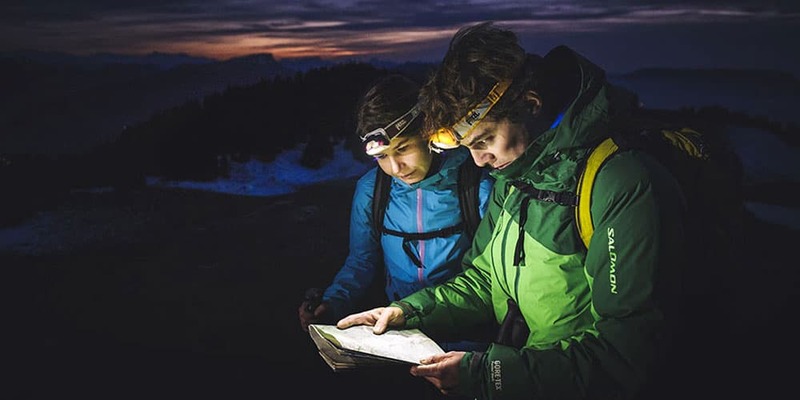 You will wear the headlamp on your head, and so the first thing you would want to ensure is that your flashlight is light enough prevent you from tiring. You can imagine negotiating a trail in the dark with a heavy bag on your back and a headlight that adds to your baggage. In our experience, we find the ideal weight to be 300 grams. Anything in this range or lighter will work excellently. Nature is unpredictable. As much as you may not be trekking under water, you would get caught in the rain. It is hard to imagine anything worse than being out in the dark, in heavy rains, and no flashlight. The ideal flashlight for trekking or hiking or any outdoor activity withstand rain and still function properly. A headlight with an IPX 4 rating will withstand water flashing from all directions. If you take it even higher to IPX 7, you get a power headlight that can withstand water immersion for up to 30 minutes in 30 meters of water. A flashlight with this rating will even survive a washing machine (not that you need to take it that far). There are two types of headlamps; those that use removable batteries, and the rechargeable kind. The good thing about those with removable batteries is that you can always bring a bunch to keep them lit. Rechargeable batteries need a solar charger or a power bank, and so you will have extra weight on you. If you prefer the rechargeable one, you may want to ensure that you can power it with ordinary batteries for when you need that. You can always buy a couple of AAAs or AAs on the road when you run out. This has everything to do with the kind of light that your headlamp illuminates. Floodlight will cast a wide beam around you, without necessarily lighting very far. With this kind of setting, you can cook a meal; inspect a wound, and other activities that require proximity. A spotlight is ideal for finding and marking trails. An ideal flashlight will light up to 100 meters, which is equal to a standard football field, but some ninjas will take it a notch higher; 150 meters. With this kind, the possibilities are endless. A red-light, which we found in the various flashlights in this review, is quite remarkable. Why is that? If an accident happens and you need rescuing, it flashes and makes you visible from a distance. Also, it extends battery life when you do not need too much light. You can make it your default lighting and fare on with your trek. We like them all equally, but we feel strongly about LE Headlamp LED. Why? Because of the four modes, the ability to set the light to your liking, and the adjustable band are great qualities in a headlamp. That, and the fact that, in its category, it shines the brightest. The price is also unbeatable. My husband bought this and once I borrowed to compare the difference between 2 pictures while lying on bed. At night, my table lamp does not work really well. It does not have enough light power that I need. The LE headlamp is so easy to use with the rubber push-in button so the light can be adjusted from low to medium to high. Also, LED light will come in handy at night for jogger or dog walker. There is absolutely no issue either with the design or DOA. I am ordering one more while writing this review. I have a little trouble when using it since I have a silky long hair. The straps slide a bit upward and toward unintended. However, it works well for my husband since he has short hair. It results in no issue with the elastic strap fitting his head. In short, it is useful and has enough illumination for most of the objects in different situation. The price is affordable also. I highly recommend this LE brightest headlamp for interested buyers. Personally, I consider this is a very generic headlamp at first due to its features, quality and workmanship. I do a short comparison between this LE headlamp with another one brand Energizer. This LightingEver headlamp has a great performance and value with just a cost 2.5 times less than the other one after trying both. One drawback for this headlamp is the large size and it is heavier than the Energizer. Yet, you don’t have to worry since vertical and horizontal headbands will keep it tie to your head firmly. The Energizer has only a horizontal band. I recommend to use the rechargeable batteries for LE headlamp. Originally, it take three AAA batteries which is not good in my opinion. It will sure get corrode over time if you don’t use this brightest headlamp much and this will destroy the lamp eventually. For the money, it is a good headlamp. The LightingEver headlamp is fine for a cheap product but I use it in crawlspaces and it falters for that purpose. I always want full light at all time but did not recognize the hindrance in different modes usage. I have to click three times just for turning it on and click twice for turning it off which is not convenient. At the beginning, I thought the red flashing light might come in handy for trouble cases. Yet, any good partner knows the bad situation without even doing anything. Also, the illumination is not very bright. To compare with my phone’s flash, the phone’s is even brighter which makes me really surprise. This LE headlamp is useful for working at night on car. The battery area should be sealed and there should be a must tighter bulb enclosure because if you rinse muddy sewage off, water can get in. Up to now, this one catches my attention the most since it has a decent quality and can be used in practical, not to mention the affordable price. Therefore, it is my recommendation and it deserves the title “one of the brightest headlamps” out there in the market. I like to use and I do think headlamp should be used with rechargeable batteries. This GRDE headlamp’s batteries come wrapped in hard plastic that makes they are protected and none of that bank breaking battery replacement expense. Since not all heads are created equally, the straps are adjusted easily to fit around! I feel very comfortable when using. There is a snug around the head to keep the light in place so you don’t have anything to worry about. One thing I don’t expect is it comes with three different charging cables! One is Cigarette Lighter Cable to charge in your car or RV. Another one is Wall Outlet Charger, to charge at home or work. Last one is USB Charging Cable to be plugged into any USB charging source. Zoom able light and adjustable power which make is easy for working on small objects, area or to have the light up the whole big area or outdoor use. Don’t be fooled when you see the small size of light lens. This can be extremely bright when it’s on higher level of brightness. There are 3 modes for low, high and emergency signaling purpose. I don’t have this product to be tested or free sample or at a discounted price. So I hope that you my opinion helpful when making decision to buy a headlamp of your own. InnoGear headlamps are awesome but the seller needs to re-work on the batteries. I cannot use the normal batteries but have to use their special ones. Those are high drain batteries. When opening the box, there was a piece of paper telling me that I have to read the user guide. Finally, after 1 hour attemp, I put a small magnet on each battery and insert them to the headlamp and it turns out to be working up to now. It is pretty bad on Innogear not to disclose this info before the purchase. I have just got mine. One good feature that InnoGear lacks of is that it is waterproof. This headlamp seems bright properly but definitely not waterproof. Battery compartment should be designed better since it is covered by a piece of rubber only. In addition, the rubber flaps almost hide the charging port. This port does not stay on tight. I would not use InnoGear headlamp in a heavy rain or in submersion. I cannot get it last 60 minutes after fullly charged. I would not recommend InnoGear headlamps to any buyers. I am a backpacker and go travelling and hiking a lot. This Shining Buddy LED headlamp was my company for a 4 days backpacking trip as my first light. I must say that it worked just fine without any complaint. There was a heavy down-pour at night and early in the next morning, I found my headlamp lying on the grass next to our tent in the water. After drying the water off with a towel and turned it on. It was still working flawlessly, so I get the soaking-wet band removed and hung it to dry. I remember once I accidently removed the headlamp and it fell off, smacked the big rock which I had been sitting on. I immediately checked the light, trying to turn it on and it work just fine. I did not have to worry about charging my Shining Buddy headlamp’s batteries since they lasted the whole trip. The illumination was still strong after extensive use at several nights. I bought extra batteries but the original ones are durable. I could not have been more pleased with the light performance. I must say I used Foxelli headlamps more than other branches but this Shining Buddy definitely better because the light beam is not focused as Foxelli, but wider than. It produces the light more pleasant than others. For just one extra dollar, I can get a better light quality so I think why not opt to this Shining Buddy headlamp. This is a good product to me. I usually use this headlamp for doing homework in a dim light room. There are two features that I think Lighting Ever headlamp does not do very good. I feel uncomfortable when wear this headlamp for a long period of time because the headband is hard. It leaves me mark on my forehead every time I put it off. There is a quick solution to put a hat on before putting this headlamp. Secondly, when the headlamp is on, the illumination gets dimmer over time. At the beginning, on my observation, it starts bright, almost the brightest headlamp that I have ever seen, yet slowly get dimmer until it does not provide enough light source. As I use it regularly, it gets dark quicker. I thought it may be caused by batteries quality or the batteries were running out. I changed them to new ones but it just does not work. I read book a lot and I like to use this headlamp for reading. I still like to know what I should do to make sure it does not dim over time. I like the LE headlamp when doing home repair. It is worth the price for a hands-free light. Cheap and works well for hands-free light! The strap is adjustable and work well. I am a female and I am able to get it fit my small head properly. The top and front are a bit heavy to me but still stay firmly on my head. I don’t use those many features and options but they are better than nothing. @Sam: agree with you on the light quality. I use LE headlamp on camping. It is by far the brightest headlamp that I have ever had. I also have a lantern but the light is dim and the form of light is bad. This LE headlamp focuses the light on the spot. The quality of its headband and harness is good. Its power is better than other in comparison. Low setting provides light more than enough. Higher setting is recommended for hiking or trekking.